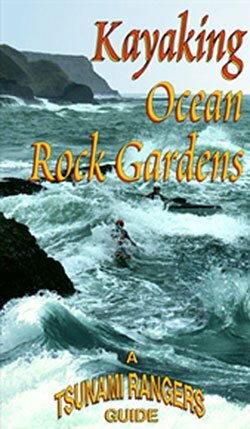 Editor’s note: Thanks once again to Barbara Kossy for her patience and helpfulness as a model! Here’s another post on kayak fitness, this time for shoulders. Shoulders take a beating when we kayak. 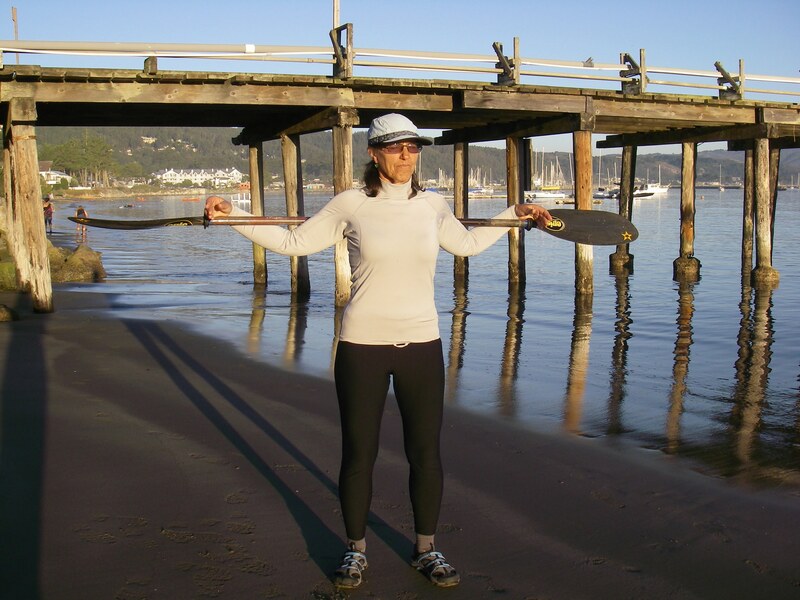 These simple exercises will help warm up your shoulders prior to paddling and release tension when you’re done. This stretch stretches the posterior, (or rear) deltoids, upper back generally, and the triceps, forearms, and inner wrists. First, interlace your fingers. Turn your palms so they face away from your chest. Expand the space between your arms by pressing your palms away from you while slightly rounding your back and hollowing your chest. Repeat this stretch after interlacing your fingers in the non-habitual pattern. The next stretch is for the medial deltoid and tricep. For this stretch, take one arm across your chest. Hook your other arm as deeply as you can under your crossed-over arm. Try to get above the elbow of the crossed arm if you can. This will depend on your level of flexibility. In the above photo, Barbara has her lower arm hooked just on top of her crossed over elbow. Bend the elbow of the lower arm. Gently but firmly draw your arm across and in toward your body using the lower arm. Be sure to keep your shoulders square! One shoulder will tend to rise and the waist will bend – this will undermine the usefulness of this stretch. The third stretch in this series stretches the anterior (front) deltoid and the pectorals. First interlace your fingers behind your back. It sometimes helps to do this with bent elbows and then extend them. With your palms facing upwards, press your knuckles down and away from you, expanding the space between your arms and your back. Lift your chest and inhale deeply, then exhale. This will facilitate the stretch. Always repeat after interlacing your fingers in the non-habitual pattern. This fourth stretch opens up the chest, shoulders, and ribs. 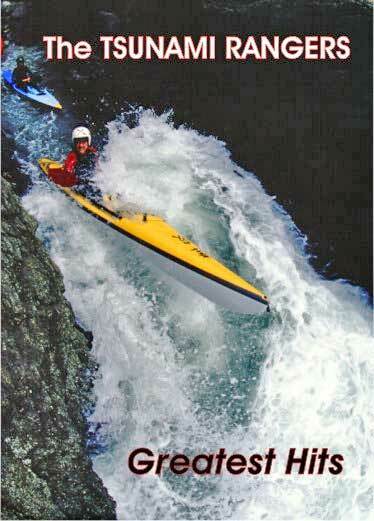 Take your paddle in a wide grip. You can play with the width of your grip to see which hand position works best for you. 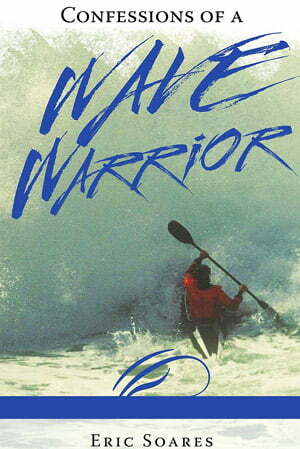 Raise your paddle up high over your head. Keeping your feet flat on the ground, stretch from your feet to your fingers with a slight backbend. You can also do sidebends or twist from side to side in this position. Keep your ribcage lifted regardless of your position. The last stretch in the shoulder series is pretty intense, so go carefully and respect your individual needs. 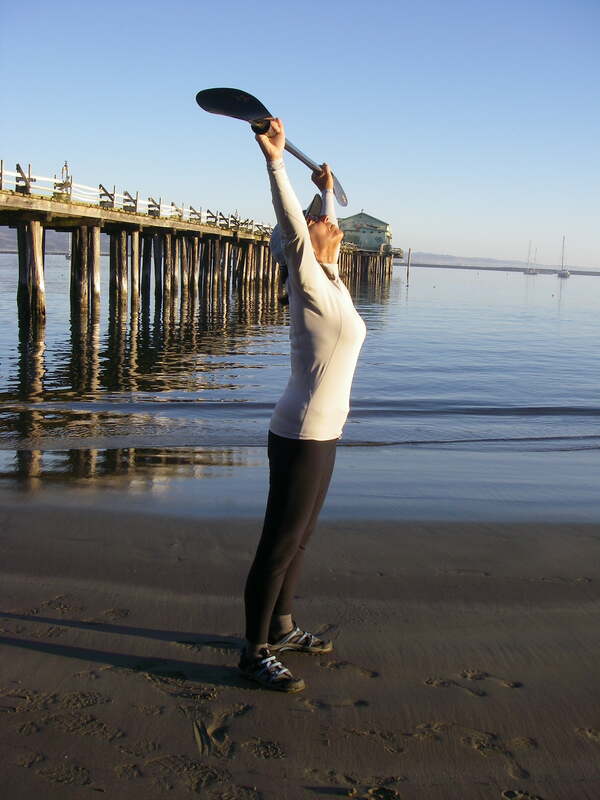 Holding your paddle in a wide grip, lower it behind your shoulders. Let your arms slide along the shaft until you can grip the shaft with your hands or drape your arms over it. Again, you can try various hand positions to achieve different results. All of these stretches should be done at least once and for at least 10 seconds each time. It’s very helpful to notice your breathing and breathe deeply in and out a few times while holding a position. This will help your muscles relax and the stretch can go deeper. Please go through these stretches carefully! Always respect your limitations and remember that you may be more or less flexible on any given day. If it hurts, don’t do it. However, it’s often interesting and useful to play around with the stretch to see what you CAN do without pain. Discomfort is okay, but not pain. Know the difference. We hope these stretches are useful and will contribute to your paddling health and pleasure! Do you find these shoulder stretches useful? Please comment below! 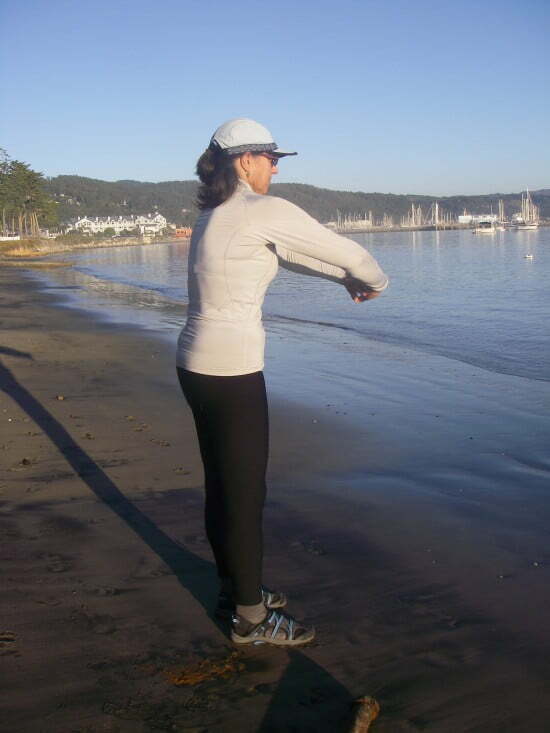 The stretches are great, and a good idea for folks having tightness from paddling. I’d recommend doing them after paddling, though. During paddling we actually need lots of shoulder *stability. * To that end, before paddling it’s good to warm up the shoulders with some dynamic movements like “air paddling,” arm swings, jumping jacks, etc. And either before paddling or on off-days, it would be good to do exercises like the quadruped, push-up position planks, side planks, dumbbell bench press and dumbbell overhead press. 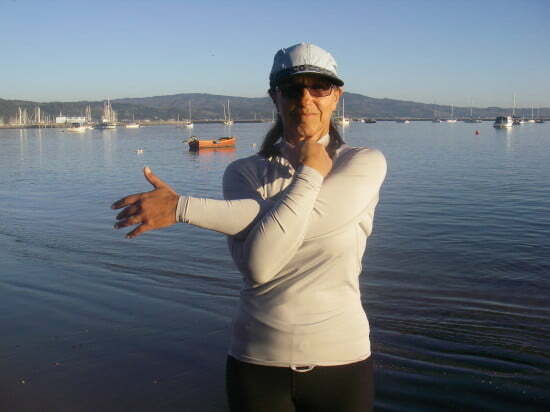 These exercises will strengthen the shoulder joint, build stability, and help prevent pain from paddling. Thanks for commenting, Ranger Don! Good to hear from you. You make excellent points. It’s true that warming up with sport specific movements is usually an athlete’s best bet. And I love your suggestion for quads, planks, and side planks. Not only do they increase shoulder stability through isometric muscle contraction, they are great core exercises as well. Personally, I’m not so fond of the presses although I know they’re great shoulder strengthening exercises. However, that’s because I blew out my rotator cuff about 20 years ago and have found that between daily activity (cleaning, gardening) jujitsu, and yoga my shoulders get about all the movement they can handle. Also, I’ve heard it said among fitness specialists that anyone over 45 years old should not perform overhead dumbbell presses because of the impingent factor in the shoulder joint (when the arm begins to rise overhead from a position parallel to the floor). I know everyone’s different, but as I sit here typing and raising my right arm experimentally overhead I get a hitch in my shoulder and adding weight to that movement would probably not be a good idea for me. Then again, I am over 45! Shoulder health, nothing can be more crucial to kayakers! As someone who’s been doing weight training for almost 50 years, I’m well past the 45 years old you quoted for overhead dumbbell presses. I do a lot of overhead weightlifting, but I do many reps (usually 25), so the weights are lighter than they would be if I were doing the standard 3 sets of 8 reps. It seems to work for me, but an important aspect you mention is knowing when to hold off (there is always some pain with weightlifting, but there is that different kind of pain that is a signal to back off). If everything is all right, I have less pain by the end of a set (endorphins kicking in), but if the pain is worse, this is a clear sign that an injury may be developing, and I then modify future lifting until I can (hopefully) return to my regular lifting routine. I like what you said about the breathing during stretching…I have long realized its importance in weight training, but I now see its importance in stretching and warming up. Thanks as always for your comment, Tony! It sounds like you’re doing the right kind of weight training for your needs. I’m sure the powerhouse distance dudes like Don K., Kenny Howell and John Dixon would bear you out regarding lighter weights (or cable training) at higher reps for effectively maintaining shoulder health, especially for racers. That’s a very different concept than traditional strength training methods which typically require high weight at low reps (usually around 6 or so). Since paddling involves almost constant shoulder movement holding a paddle, training low weight/high reps mimics the sport exceedingly well. And as for the overhead presses, I feel pretty sure the caveat applies to heavier weights – something you’d only be able to lift about 5 or 6 times before fatigue sets in. That’s when you can really damage the joint.